“Pray for World Peace!”, said the Boy in enthusiasm. I looked at him and bluntly told him that we were not running for any Miss Universe competitions. His smile disappeared and as usual I quietly acquiesced. I can’t bear to see his frown, and lately, I’ve been getting frowned at more and more. I call it my “foot in mouth” syndrome. I tend to blurt things out before thinking about the result. Happened at work, happens with family, happens with friends, and mostly happens with him. I don’t really mean what I say, or if I do mean it, I didn’t mean for everyone to hear about it. I think it’s because I have too many inner monologues within me, and I forget that when I speak up/out, everyone is able to hear me too. I digress, as is my usual predisposition. 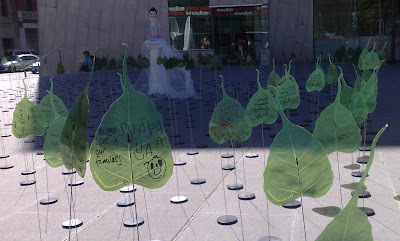 We were filling out these leaf thingies and writing our wishes on it and placing it in full view of everyone so that when Wesak Day (Buddha’s Enlightenment Day) comes around, B.L.I.A. (the Buddhist society) will pray for us and hope that our wishes come true. And I usually say, it’s not hokey pokey.. there’s no magic involved. It’s a belief. And besides, what do you have to lose by making a wish? And praying so much for the wish to come true? If it comes true, I can send my heartfelt thanks to God, and if it doesn’t come true, then I can blame it on Karma! But seriously, there’s nothing wrong with making wishes. Everyone should have a wish/goal they want to achieve or come true. Without it, life doesn’t have much meaning, and what else is there left for us to do? So to all the Gods out there(To all the pagan haters, shame on you), ancient, current, forgotten, fantasy, faerie, make my wish come true.